It was in the capital city of Mauritius that Louis Fernand Collet was born on the morning of the 6th August, 1858, at 8.00 am in Duponce Street, Port Louis. He was the eldest child of a clerk, Louis Michel Collet, and his wife Marie Louise Clemence Gallanty. Over the years, Mauritius had become an important port of call for world trade, with sugar being its major export. When the Suez Canal opened in 1869, Mauritius lost much of it's strategic significance along with the associated ship victualling and repair business. This resulted in Port Louis experiencing an acute depression which saw many businesses fall into bankruptcy. It seems that by the late 1870s, Fernand's family and Dubois friends had decided to leave Mauritius and were making plans to migrate to Australia. His maternal uncle Jean Gallanty appears to have been the first to leave around 1880, finally settling in the north Queensland district of Mackay. In this tropical, sugar cane country the Mauritians would have felt right at home and been able to contribute their expertise to the fledgling sugar industry. When he was 23 years old, Fernand Collet and his friend Oscar Dubois left Port Louis on the 31st January, 1881, as the only two cabin passengers aboard the "Clodian" bound for Australia. Just over a month later, their ship arrived in Hobsons Bay in Victoria (near Geelong), on the 9th March. The young men then travelled up the coast to join Fernand's uncle Jean Gallanty in Mackay . The two young men soon secured work in the sugar cane industry. Oscar obtained employment as a sugar-boiler while Fernand later stated he was a "sugar manufacturer". Exactly what this means is not yet known, perhaps he and Oscar were also farming their own cane. Just over a year after his own arrival, the remainder of Fernand's family left Mauritius to join him in Mackay. The Collet family arrived in Melbourne aboard the "E.J. Spence" on the 8th July, 1882, and then travelled on to Mackay. With them was his uncle Jean's wife and daughter, and another uncle, Evenor Gallanty. Plans must also have already been made back in Mauritius, for Fernand's own marriage. In the new year, Oscar Dubois' family came to Sydney from Mauritius arriving on the 1st January, 1885. Either at this time or very soon afterwards, Fernand travelled down to Sydney where he was reunited with his fiance, Oscar's second eldest sister, Ines Dubois. Fernand and Ines were married on 3rd February, 1885, at 597 Dowling Street, Sydney, in a Presbyterian ceremony. The Collet family were Catholics but for some unknown reason the Dubois family had abandoned Catholicism when they left Mauritius. So the Presbyterian ceremony must have been in deference to the bride's parents wishes. After their marriage, Fernand took his new bride back to live in Mackay where they would start their own family. By that winter Ines was expecting their first child. Their daughter was named after both her grandmothers, Marie Louise Elisa Rachel, and was born on 25th February, 1886. 7 The following year their son was born on Christmas Eve, the 24th December, 1887. They named him Pierre Fernand Louis, after his father and grandfathers. Fernand and Ines were Catholic and raised all their children in this faith. Sometime after the birth of their second child, Fernand moved his young family to South Australia. Most likely this was due to a business opportunity. The Collets third child, Herbert Michel, was born in Exeter, South Australia, on the 28th October, 1889. By December of 1890, Fernand was recorded as living at Birkenhead in Adelaide where he was working as the Manager of a Salt Works. He made an application for letters of patent with the N.S.W. Patents Office on the 30th December, 1890, for his invention named "improvements in the manufacture of salt". After an initial problem with some of the wording regarding the application, which required clarification, the patent was subsequently approved. It seems that a few years later, Fernand sold the rights to his patent to The Castle Salt Co. Ltd of Adelaide around April, 1895. The Collet family returned to Mackay, where the birth of their fourth child Tristan Louis, on the 7th July, 1894, was registered. 7 By 1899, Fernand was listed as living in Shakespeare Street, Mackay, and running his own cordial manufacturing business. This venture was successful and later changed with the times to become an aerated water manufacturing business. By about 1900, Fernand is listed in Postal Directories as being the Manager of the Mackay Salt Company, a post he held for about the next 7 years. Quite possibly the salt company operated from Habana Road, The Orphanage. This was an address also given at times by his uncle Evenor Gallanty. The Orphanage was said to be a property located between Habana and Bucasia Roads. Adjacent on Bucasia Road was an actual orphanage from which the property got its name. Whether the salt company was his own business or a shareholder venture is not yet known. 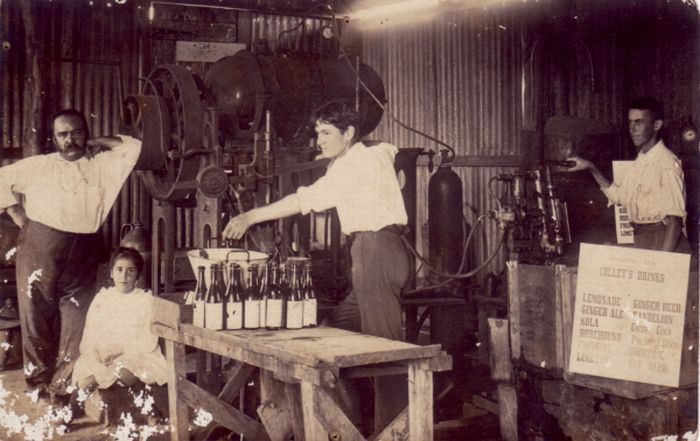 By about 1907, Fernand had moved to Peel Street, Mackay, where his aerated water business also operated from. This was the family's residence for about the next 12 years. For a few years, the address was listed as Milton Street which ran parallel to Peel Street so this was probably the back entrance of the same property. A photograph of his factory shows it was a fairly small family concern, of bush timber and corrugated iron construction with hand operated machinery. They appear to have used a variety of recycled bottles - black glass beer, claret and large 'blob-top' corkers - as well as some of their own branded stoneware ginger beer bottles and glass 'blob-top' corkers. A 1910 advertisement in the "Mackay Daily Mercury" states ... "his long experience in the trade, combined with up-to-date machinery, enables him to manufacture all kinds of Aerated Waters of the highest order, at a moderate price. All his beverages are perfectly pure and made in accordance with the Pure Food Act. 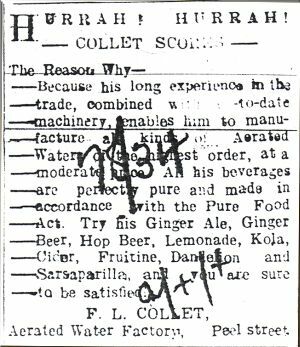 Try his Ginger Ale, Ginger Beer, Hop Beer, Lemonade, Kola, Cider, Fruitine, Dandelion and Sarsaparilla, and you are sure to be satisfied". From a sign visible in the factory photograph, they also produced Horehound, Cherry Cider, Pineapple Cider, Limette and Cocktail. Political tensions in Europe finally saw Britain declare war on Germany on the 4th August, 1914. Like many other families, the war would have a huge impact on the Collets. Fernand and Ines' 26 year old son Herbert, decided to join these early recruits and enlist in the AIF, joining up at Mackay on the 7th March, 1915. Herbert was assigned to the 25th Battalion of the AIF, 'C' Company, comprised of mainly Queenslanders with a small contingent of men from Darwin, which would form part of the 7th Brigade. While Herbert was in basic training troops were being deployed in an assault on the Gallipoli peninsula, the first landing being on the 25th April, 1915. 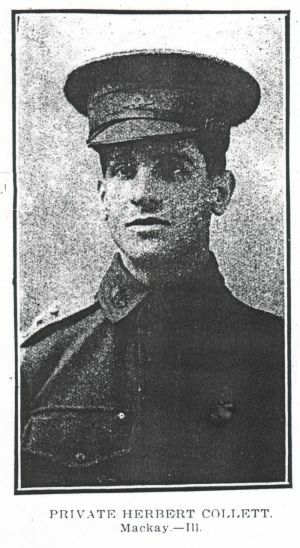 Private Herbert Collet's unit left Australia from Brisbane on the 29th June, 1915, aboard the H.M.A.T. "Aeneas" for further training in Egypt. Whilst in Egypt it was decided to form these units into a Second Division which was deployed from Alexandria on the 4th September, 1915, to join the Mediterranean Expeditionary Force manning the trenches on the Gallipoli Peninsula. 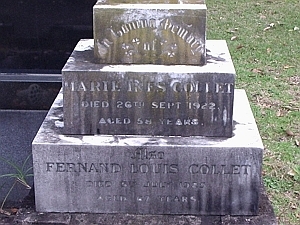 Sometime around 1915, Fernand's widowed father Louis Collet moved to Peel Street, Mackay, most likely living with him and Ines. By the end of 1915, the Collets had been advised that Herbert was sick and in hospital in Malta. Understandably worried they sought further information and in January, 1916, were informed their son was on the hospital ship "Esquibo" bound for Egypt and then Australia to convalesce. Herbert sent a cable from Cairo on 16th January, to his parents in Mackay to tell them he was coming home. Fernand and Ines travelled down to Sydney to await their son's arrival, staying with Ines' step-mother Leopoldine Dubois. By the 1st February, they were staying at her Hampden Road, Artarmon, home. It seems while they waited, Fernand may also have been investigating business possibilities in Sydney with a view to relocating. The months went by with no further news, until the Collets were forced to return to Mackay in early April. At the end of May, they finally received a telegram advising Herbert had been wounded. Naturally, Ines was extremely worried by this news, prompting Fernand to write requesting any further details. By the end of August, the family received the sad news that their son, Herbert Collet, had died in France at the 5th Ambulance station, from wounds received in action on 4th August, 1916. He was only 26 years old. Portrait of Herbert Collet from the North Queensland Register, April 3, 1916. Herbert was buried in Becourt Military Cemetary in France. His parents would later erect a memorial headstone for him in a family plot in Northern Suburbs Cemetery in Sydney. After their terrible news, the Collets left Mackay and moved to Sydney. Possibly Ines needed the comfort of her mother and family around her. Certainly, Fernand would become close to his brother-in-law, Evariste Dubois. By the 7th September, 1916, Fernand and Ines were living on the corner of Hampden & Mowbray Roads, Artarmon, most likely in a rented property. Fernand was negotiating with the proprietor of the Mosman Cordial Works, Mr George A. Ferguson, to buy his three year old business. Around October, 1916, it appears he purchased the stock-in-trade and possibly goodwill of this business and relocated it to his Mowbray Road address. By January, 1917, they were still living at this address and their daughter Rachel is listed on the Electoral Roll of that year as a teacher at Hampden Road, Artarmon. Fernand's father, Louis, also moved to Sydney, living with his widowed daughter, Ivana Dubois at Francis Street, Artarmon. Fernand submitted a building application to Willoughby Council to erect a brick cottage at 307 Mowbray Road, on his block of land measuring 47 ft x 190 ft (two doors north of the Young Street intersection). 55,41 By mid 1917, the home was finished as their address was stated as "Pozieres" Mowbray Road, Chatswood 25 (the house still stands today, but is divided into two flats with the rear of the block resumed for a street 41). The council rate books list Fernand as a manufacturer working from a shed initially at the rear of a vacant building site and then the rear of "Pozieres". In 2003, an elderly resident recalled the factory being there when she was a little girl. It seems Fernand continued to use Mr Ferguson's branded bottles as during the early 1980s when the excavations for construction of Chatswood Chase shops were going on, several of these bottles were unearthed. He also used his own stone, one gallon demi-johns, branded "This Jar is the Private Property of F.L. Collet, Chatswood" with an impressed pottery stamp dated 1917. Fernand does not seem to have advertised in the business directories of the day, possibly only supplying his immediate district. 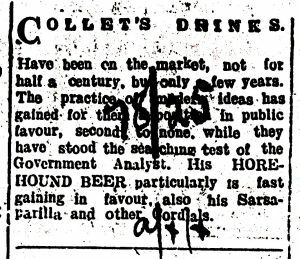 It appears the Collets may also have still been running their business in Peel Street, Mackay, at the same time, most likely with the help of their sons and perhaps Alfred Dubois(?). By about 1919-20, the Collet family disappears from the Queensland postal directories and Chatswood became their permanent home. Fernand's retired father, Louis, came to live with them at "Pozieres". Both Fernand and his son Tristan, stated their occupations on the Electoral Rolls as cordial manufacturers. Around this time Ines became ill and it was found she was suffering from stomach cancer. How long she was ill with cancer is not recorded on her death certificate, but she died on the 26th September, 1922, at the age of 58. Fernand buried her the following day at 3.00 pm in the Catholic section of the Northern Districts Cemetery. The headstone of Fernand and his wife Marie at Northern Districts Cemetery. After the death of his wife and father, Fernand decided to retire from business and sell "Pozieres" at 307 Mowbray Road. Trade journals contain no record of the business or stock-in-trade being offered for sale so he either just closed the business or passed the equipment on to his son Tristan. Sometime in 1923, his house was sold to a Mrs Harriett Henderson (R.H. Henderson) who renamed it "Milverton". Fernand moved to live in a house named "Rangitira" in 26 Anderson Street, Chatswood, not far from the railway station. At some stage both of his daughters decided to become nuns entering the Sisters of Mercy, North Sydney Order. Rachel adopted the religious name of Sister Urban while Malvina became Sister Beatrice. Fernand would only outlive his wife by a few years, dying at the age of 66 years on the 5th July, 1925, at his brother-in-law, Evariste Dubois' home, "Villa Des Roses", Grosvenor Road, Lindfield. Fernand Collet's funeral was held on Tuesday, 7th July, leaving from his home at 10.00 am for the Catholic section of Northern Suburbs Cemetery. Lamb, Karen (2005), History of Louis Michel Fernand COLLET , unpublished. An interior photograph of Fernand Collet's Softdrink factory. Fernand Collet standing to the left and presumably his children. A broken Collets marble bottle. Another style of the Collet's Marble bottle. 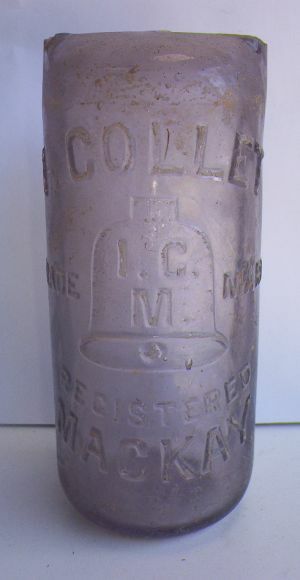 A Collet's Stone Ginger Beer bottle. A Collet's Blob Top bottle with similar embossing to the above Marble bottle.